The "Symposium on Aneuploidy: Etiology and Mechanisms" was held at the Carnegie Institution of Washington Auditorium from March 25-29. 1985. This Symposium developed as a consequence of the concern of the Environmen- tal Protection Agency with the support of the National Institute of Envi- ronmental Health Sciences about human exposure to environmental agents that cause aneuploidy. The program was chosen to explore what is currently known about the underlying causes, the origins, and the extent of the prob- lem of human aneuploidy, and whether exposure to environmental agents is assodated with an increased incidence of aneuploidy in humans. Basic research findings in the area of mitosis and meiosis were presented and related to possible mechanisms of how aneuploidy may be produced spontane- ously and chemically. A survey of data regarding the chemical induction of aneuploidy in experimental organisms was presented. Outstanding scientists from different fields were invited to cover a broad perspective of aneu- ploidy from the molecular aspects to the human situation. We hope that the publication of the proceedings will share the enthu- siasm of the meeting and its scientific content. The topic of aneuploidy has received little attention and it is the purpose of this Volume to establish a scientific basis for assessing health risks posed by environ- mental exposures to aneuploidy-inducing chemicals. 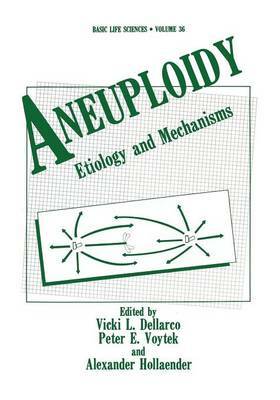 Vicki L. DeJlarco Peter E. Voytek Alexander Hollaender vii ACKNOWLEDGEMENT The Editors of the proceedings of the "Symposium on Aneuploidy" wish to acknowledge the support of Dr. Elizabeth L.